When Kevin Zager's grandmother gave him her 1965 Dodge Coronet 440, she knew it would be in good hands  and, as you can see, Kevin has restored the vehicle to its original condition. 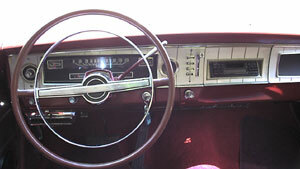 However, she never could have envisioned the sound system that resides currently in this dazzling Dodge. The Sony XR-430 cassette receiver (circa 1995) reigns over the system, furnishing near-CD quality tape performance and top-notch reception. The signal travels via StreetWires Zero Noise 5.0 patch cables from the XR-430's preamp outputs to the Sony XEC-1000S electronic crossover in the trunk. The Sony crossover divides the frequencies thusly: 80 Hz and below to the subs; 80-5,000 Hz to the mids; and above 5,000 Hz to the tweeters. 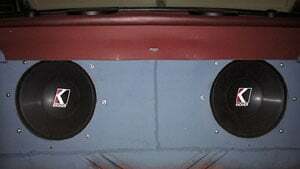 Kevin also mounted the three Rockford Fosgate amps, the 1-farad Lightning Cap, and two Kicker Freeair subs in the mammoth trunk. The 4-channel Rockford Fosgate Punch 800a4 sends 100 watts RMS to each of the two front Polk MM3000 tweeters and Kicker Resolution 5-1/4" midrange speakers; the second 800a4 takes care of the rear Kicker Resolution 6-1/2" mids and Polk dB3000 tweets. Low frequencies are handled by the Rockford Fosgate Power 800a2 amplifier, which sends 200 watts RMS to each of two 12" Kicker Freeair subwoofers, concealed behind a baffleboard for the ultimate in Stealth bass! The 1-farad Lightning Audio capacitor keeps a reservoir of power ready for peak demands on the Rockford Fosgate amps. Kevin used StreetWires 2-gauge power cable (with a Rockford Fosgate 100-amp circuit breaker) to get power to the amplifier trio. Rockford Fosgate WhiteWolf speaker wire carries the signal to all speakers. The photographs speak for themselves. All we can say is  Kevin, what a sweet ride! 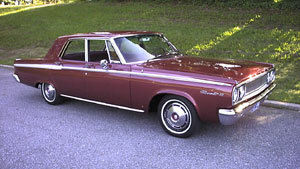 Kevin Zager's 1965 Dodge Coronet 440  a true classic from Detroit! The Sony XR-430 receiver brings first-rate cassette performance to dashboard Nirvana. 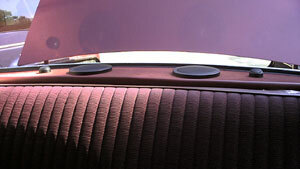 Polk MM3000 tweeters and Kicker 5-1/4" midrange speakers are sitting pretty in the Dodge's door panel. 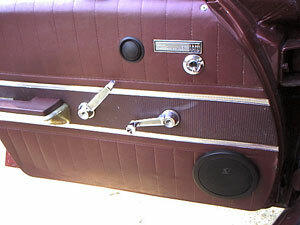 Kevin installed Kicker 6-1/2" mids and Polk dB3000 tweeters on the deck for an impressive rear fill. Now that's a trunk! Amps, subs, capacitor, and crossover all fit nicely with plenty of room to spare. 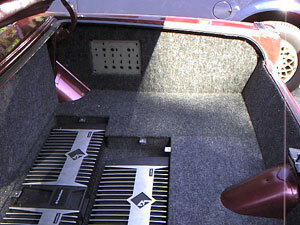 The Kicker Freeair subs with the seat back removed.